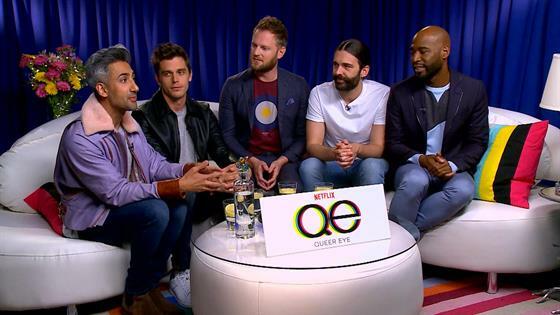 Netflix has renewed Queer Eye for season three, as if they'd ever be willing to part with the fab five, and production is set to start July 16 in...Kansas City, Missouri. And yes, every member of the new Fab Five will return. Stars Bobby Berk, Karamo Brown, Jonathan Van Ness, Tan France, and Antoni Porowski previously weighed in on what they want to see in the future of the show, and that's to spread their wings even further than small towns around Atlanta, Georgia. "The thing is that we had a great time in Georgia, to shoot the episodes and meet the Heroes here. But the thing is our Instagrams and DMs get lit from people around the world that are just like, 'Can you come to my city? Can you come to my town? Can you come to my country?' And my hope is that we can just continue to go from city to city—," Brown told E! News, with France adding, "Country to country." The fab five has already done a bit of international traveling and released a surprise extra episode alongside season two which featured the gang heading to Yass, Australia. There, they made over a farmer named George as well as a local pub, and proved that Queer Eye can even work on the other side of the world, and that we'll take Queer Eye anywhere, any time we can get it. The new season will be eight episodes. Queer Eye was nominated for four Emmys in the Structured Reality Program, Casting, Picture Editing and Cinematography categories. Queer Eye season two is now streaming on Netflix. Season three will premiere in 2019.